We all know using Instagram is crucial for any business. It’s the perfect way to relay the personality, features, and benefits of our stores. And using the right mindset, it will be a lot of fun on both sides of the screen. I’ve always loved social media. I built a successful online business, CraftyChica.com, and used the various social media platforms to build a full-time career and a strong national community. I decided to use the same techniques for Mucho Mas Art Studio, a Phoenix Latinocentric gallery and boutique I opened last year with two other local artists. I learned posting for a physical storefront is much different than for an online brand - but I excitedly accepted the challenge! Because of CraftyChica, I’d been invited to the Facebook and Instagram headquarters three times in the past year-and-a-half. My recent visit was this past March where a group of online influencers from all over the country was trained on best practices for Instagram and Facebook! I found the information to be so helpful, I thought I’d share the Instagram portion with all of you. These are directives coming straight from the Instagram team! Their only mission is to help users have a positive and successful experience with the platform. We were told that the changes aren’t meant to drive us crazy, but to help us. I learned that the Facebook and Instagram teams are very action-oriented. They are always coming up with ideas to help the platform evolve. The goal is for everyone involved to have an authentic experience. So the more people try to rig the system, the more apt they are to change the game to prevent that. Example of a user's Explore page. GOAL: They said our goal for our Instagram business pages should be to have our content end up on users' "Explore" pages, where content is generated by Instagram's algorithm based on the user's interests. It’s the golden ticket to being exposed to a wide audience! It’s a different experience for every user. The more we do all of the below, the bigger the chance we have of getting on that page. One big takeaway - Instagram is all about “hyperlocal” - they want us to show off our city, and our lifestyle in our city, how and why we are proud to live here. In addition, make sure to use these on EVERYTHING you post! The goal is for users to feel motivated to take action - via a like, a comment, a share or tagging. There is no such thing as shadowbanning on hashtags. You should know if you've done something wrong according to Instagram's policies. Don’t become obsessed with the look of the “nine-grid” - yes, it makes it pleasant to look at, but most people are scrolling through and see one picture at a time. So make sure you put your effort into each photo as a stand-alone, rather than trying to match your grid. NEVER delete a photo - archive it instead! When you delete a photo, it sets your momentum back to zero and you have to start all over. If you have old posts you don’t want, you can archive them. It saves them and you can add it back in later in the original timeline. Did you know you can follow hashtags on Instagram like you can for a profile? “Follow” the hashtag feeds related to your industry (including #LocalFirstAZ!). Interact on those photos to be a part of the story, make new friends and expose your business to new people! Stories is loaded with features you can use to make your entries pop! There are a zillion types of hacks you can use - check out YouTube to see them. When posting stories, play with all the features offered along the bottom of the screen - Focus, Boomerang, Live, Rewind, Superzoom, etc. Use location tags all the time! And be sure to tag other profiles that you mention, because they may decide to share the story that they're tagged in. Thanks for reading, I hope you found these tips helpful! This article was written by LFA member, Kathy Can-Murillo of Craft Chica & Mucho Mas Art Studio in Downtown Phoenix. 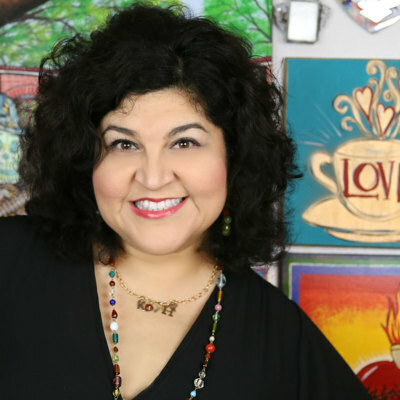 Kathy Cano-Murillo is a speaker, artist, and author of nine books (two of them novels). I write articles about Latino-inspired crafts, Phoenix life, recipes, pop culture, travel, entertainment, shopping, books, entrepreneurship and more! My goal is to spread positivity through creativity through my handmade goods, artwork, articles, books, product lines and workshops!